BearGuard - BROWN - Big Fat 6 oz Tin! Buy 3 - Save $6 - Buy 6 or more and Save $24 or more! FREE SHIPPING! 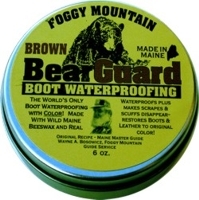 Over the years, from time to time we would hear from our customers who loved BearGuard waterproofing wax for leather but wished it would cover up the scuffs and scratches on their well-worn boots. Because Original Bear Guard was a light honey-colored paste, it went on pretty much clear. So, we thought “why not put in some color?” And the first ever leather waterproofing wax with color was born. BearGuard brown leather boot polish gives you all the leather boot waterproofing and conditioning performance of Original BearGuard with a brown color that will spiff up even the most work-worn brown boots you own. If you want the World’s Best Leather Waterproofing plus put a little color in your life, BearGuard brown waterproof boot wax is for you. Now you can waterproof your brown shoes, boots, leather bags, saddles -- anything leather and cover up scuffs and scratches and restore them to look some sharp! Packed in a big fat 6-oz. tin. We also have black boot waterproofing wax.